"Sister Delia, you look lovely!" Brother Raul shook Delia's hand vigorously. His wife Marguerite slapped his arm playfully. Delia stretched the grin on her face wider, lips trembling with the effort. Raul actually preferred a woman with more meat on her, but he could see in Delia's smile, she enjoyed hearing how well her diet showed. "Leave our Sister alone in the House of the Lord," Marguerite chided, as always. She didn’t mind Raul's silly game on Sundays. The rest of the week he was meek as a rabbit. Raul said, "This is only the Lord's front porch." The women laughed as if they'd never heard him say that before. "Pastor!" Delia called out as he passed. "Can I speak to you?" Pastor Tony clutched his keys a little tighter. "Sister Delia," he said. She asked, "Are we hosting the mobile shelter next week?" Tony sighed. Several area churches took turns hosting thirty homeless men and women to sleep overnight for a week. When he'd first proposed participating, Sister Delia had been one of the most outspoken opponents. He said, "Don't worry. We'll keep the sanctuary locked up tight." "Actually..." Delia said, then took a deep breath. Other church members may have been swayed by their natural deference to a man of God, others by Pastor Tony's good looks. A few may have even believed the church had some responsibility to use their limited resources to minister to people who'd proven they could not be trusted. Delia had fallen prey to none of those arguments, but she'd been in the minority. Delia swallowed hard. Things were different now. "I want to volunteer as a host parishioner," she said. On shelter nights, Pastor Tony and four other church volunteers slept alongside their homeless "guests." Tony said, "Why, Sister Delia!" He beamed with the pride of knowing he had finally softened the heart of one of God's most recalcitrant sheep. Delia pulled into the parking lot the next Sunday evening as she had hundreds of times before. In twenty years of attending services at Victory Life Church, she'd never slept there. Never even dozed off during a sermon. Well, not often. Separate groups of men and women had gathered on the sidewalk, trying to appear as if they weren't watching the church door intently. Delia stepped out of her car. She took her sleeping bag and one small case from the back seat. Everything else was packed away safely out of sight in the trunk. Once inside, her church looked like it did when preparing for any event. Women chattered in the kitchen over chopping boards and boiling pots, while men set up the multipurpose room. 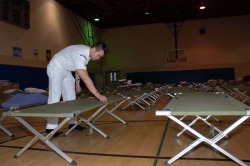 Rather than lining up chairs, though, they were setting up cots. Pastor Tony showed Delia the layout. "We've put up the divider," he said. "You'll have a cot by the door on the women's side." He smiled. "Can you help serve soup?" Over dinner, the hosts dispersed themselves among the tables, making small talk. Delia sat with a quiet young man in jeans and an electric blue t-shirt. His thick black hair hung down in his eyes. He gave short answers to her questions in a soft voice: Miguel; twenty-two; Highland Park. After dinner Delia helped with dishes, then wiped down the counters. When Sister Linda offered to do the mopping, Delia took the mop from her and said, "You go on home. I'm here for the night." Linda bristled, thinking, you can sleep over because you don't have a husband to go home to, so don't be so stuck up. But she didn't say anything. She put on her coat and left. Delia changed into her gray sweatsuit in the ladies' room. No showers, but the cot would be a luxury. Brushing her teeth, she watched the homeless women in the mirror. They moved around each other in the narrow space with exaggerated care, avoiding physical contact. She caught the eye of an older woman with a lean face and ashen skin, who looked away quickly. Delia felt the other woman's shame in the pit of her own stomach. Delia leaned over and spat chalky toothpaste foam into the sink. When everyone had settled into their cots and the lights were off, Delia slipped into her sleeping bag. She stretched her legs their full length, impossible to do in the car's back seat. The sounds of strangers breathing, the squeak of metal and canvas as they shifted on their cots, though alien, comforted Delia. No policeman would tap on her window in the middle of the night and say you can't sleep here. No strung-out hoodlum in the throes of a psychotic episode would pound the trunk screaming to be let in. There would be eggs and coffee in the morning. She would arrive at work with a full stomach. fifty-three years. But when she did, she was haunted by horrific memories of packing in a rush so she could be gone before the sheriff’s deputy arrived. The hardest had been her Baby Jesus collection. She couldn't take them all. She'd had to choose favorites. How would God punish her for the ones she'd left behind? Baby Jesus in his manger. Sweet Baby Jesus in Mary’s arms. Porcelain, plastic, ceramic, glass, all were equal in the eyes of the Lord. But not in Delia's. She’d selected five. Then three. Then, eyelids swollen almost shut from weeping, she'd found room in her suitcase for two. A man on the other side of the partition coughed softly, startling Delia back to the present. It had all begun with a homeless man. If she'd known how missing that first mortgage payment would lead to where she was now, she would have given the grimy man every last dime. Her life still would have come to this.